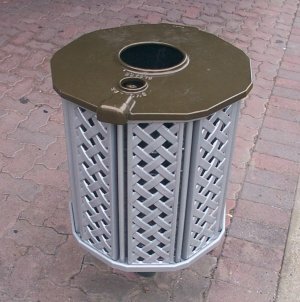 The Olds Heritage litter Bin has been developed as a result of special requests. Its solid all cast alloy construction will last for many years while being specially designed to be user friendly to the garbage removalists. Optional powder coated interior bin is also available in stainless steel. A special lock and key has been designed for the lid which automatically locks when closed. The assembly is mounted on a 700mm long, 76mm diameter galvanised tubular column suitable for concreting in place. Alternatively, a mounting flange and short column can be supplied without lid for use with open top. With this arrangement it can also be used as an attractive "planter". Normally finished in Hawthorne Green, other colours are available on request. Comes complete with column and liner.